Music by Lost Cause, www.musicbylostcause.com :for the group I sing with. We have one CD and do performances upon request. Created using a customized template and site creator provided by Network Solutions. Images were custom created for the site, as was all content. Links to CDBaby.com for CD sales, and a guestbook. Atlantian New Regalia Committee, regalia.atlantia.sca.org :a committee dedicated to procuring new crowns and coronets for the Kingdom of Atlantia. Pictures of the current crowns were on display, as well as several pictures of extant crowns from the appropriate time periods, to give those placing bids and idea of the current collection as well as period examples. 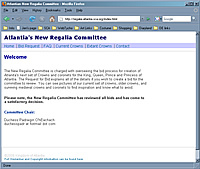 I served on the committee, collected the finished crowns at Gulf Wars 2007, and created and maintained the website using a Dreamweaver CSS template. Graduate School of Management and Technology, semesterly meeting webpage containing the agenda, PDF files of the presentations, links to relevant materials and policies, links to any workshop registration, and archived video links of the proceedings. Information is collected and updated for the Fall and Spring semesters. A CSS template, designed by UMUC's Marketing Communications department, is adapted and used, and the page is created anew and updated in Dreamweaver each Spring and Fall.